The GE Logiq E9 ultrasound machine is remarkable in its capacity to meet a wide variety of general imaging needs with a far-reaching spectrum of technologies and capacities that are unique to its kind. This machine employs intuitive XDclear technology and features superiors to all else available on the market today, which include Volume Navigation, Scan Assistant, and Compare Assistant. These impressive new capabilities provide clinicians with the ability to optimize images, improve image acquisition, and customize image view with ease and speed. The GE Logiq E9 ultrasound machine is a powerful pioneer in the ultrasound landscape today, due to its extraordinary image quality, unsurpassed volume navigation, and enhanced workflow technology. 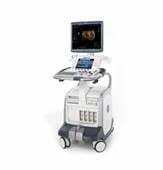 It integrates real-time ultrasound imaging with other modality imaging such as CT and MRI. With the help of an intuitive scan assistant, it reduces unnecessary keystrokes and improves consistent image acquisition. Standardized protocols and image review of prior studies are made effortless with Compare Assistance technology. Similar systems to the GE Logiq E9 ultrasound machine include the Acuson Sequoia 512, the Philips iU22, and the Siemens SONOLINE Antares.